This wall of posters illustrates the virtue of repetition. See a word often enough and you’re likely to pay extra attention. In this case the word is practically audible. It’s like listening to a somewhat manic language instructor. The wonky lettering creates a playful feeling. Check out the unusual “K”. The quirky illustration is a perfect match for the eccentric appeal of the letters. 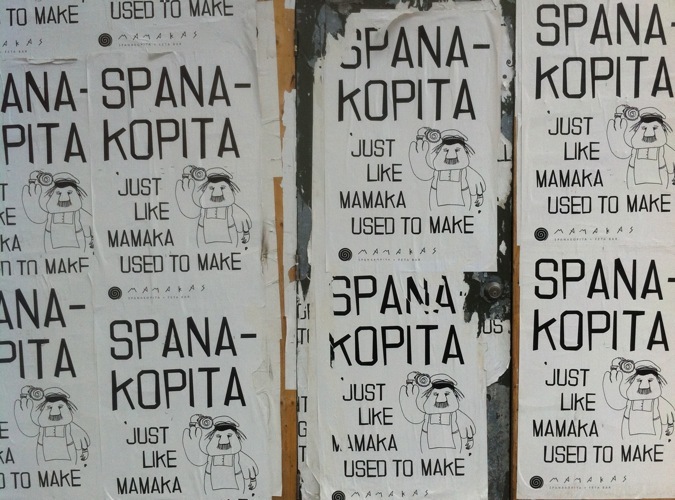 I can’t wait to try Mamaka’s spanakopita. If it’s anywhere near as flavourful as this poster, I’ll fall in love with it. This entry was posted on July 15, 2012 at 8:47 pm and is filed under Uncategorized. You can follow any responses to this entry through the RSS 2.0 feed. You can leave a response, or trackback from your own site. My studio is just around from these. So there was a big blitz with there posturing ,covering up the previous days graphite work with a variety of different, same style posters. But alas to say you will not get a chance to try their spanakopita, I think they used up their budget on paper, glue and ink!